From ground-breaking designs to record-breaking movements, the Bulgari Octo collection launched in 2012 has already become the luxury brand’s best-selling men’s watch line. We take a closer look. Founded in Rome in 1884, Bulgari has more than one icon up its sleeve. The distinctive jewellery creations, the powerful Serpenti collection and the famous Bvlgari Bvlgari watches are all recognisable at a glance. And they have all been inspired by the treasures of Rome, from its architecture and history to modern-day chic. 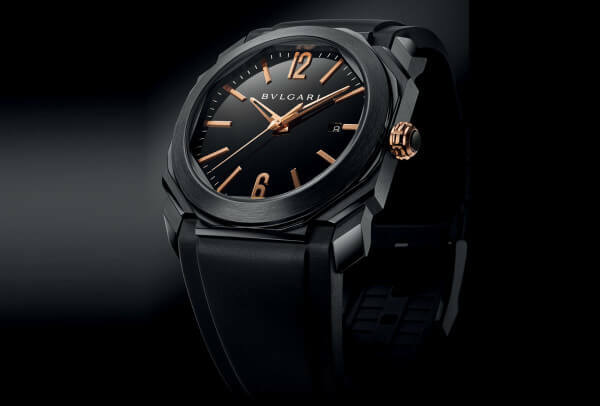 Launched in 2012, the Bulgari Octo – the latest addition to the Bulgari watch family – is already well on its way to becoming the luxury brand’s next icon. Showered with worldwide attention from the start, the watch has developed into a collection that has gained international recognition for both its design and technical achievements, rewarded with two very impressive world records in just five short years. But, as is often the case, the “rapid rise to fame” is the result of long-term planning that has been many years in the making. 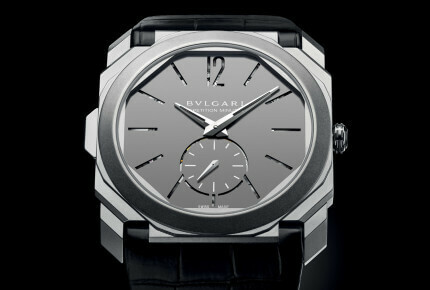 The watchmaking of Bulgari is italian design codes with Swiss watchmaking skills. While designers were busy working in Rome, Bulgari was implementing a long-term strategy of vertical integration with the acquisition of top-level manufacturing facilities in Switzerland. 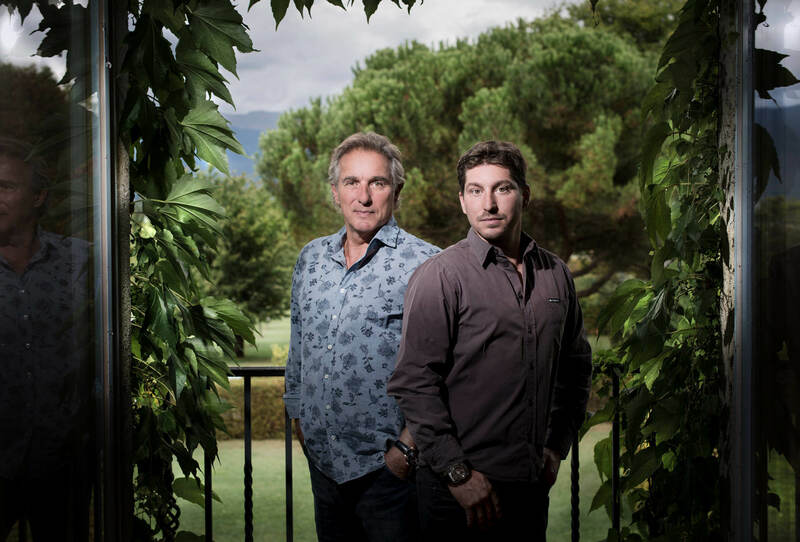 It already owned Le Sentier Manufacture GG&DR, purchased from The Hour Glass Singapore shortly after Bulgari’s takeover of the Gérald Genta and Daniel Roth brands in 2000. The Design Centre moved from Rome to Neuchâtel, Switzerland, during the period 2009-11 for easier coordination of the different sites, today composed of Le Sentier for mechanical movements (from automatic base calibres to the highest complications including chiming watches and tourbillons), La Chaux-de-Fonds for high-end dials, Saignelégier for cases and bracelets, and the Neuchâtel headquarters that house the assembly workshops along with design, after-sales, management and marketing. 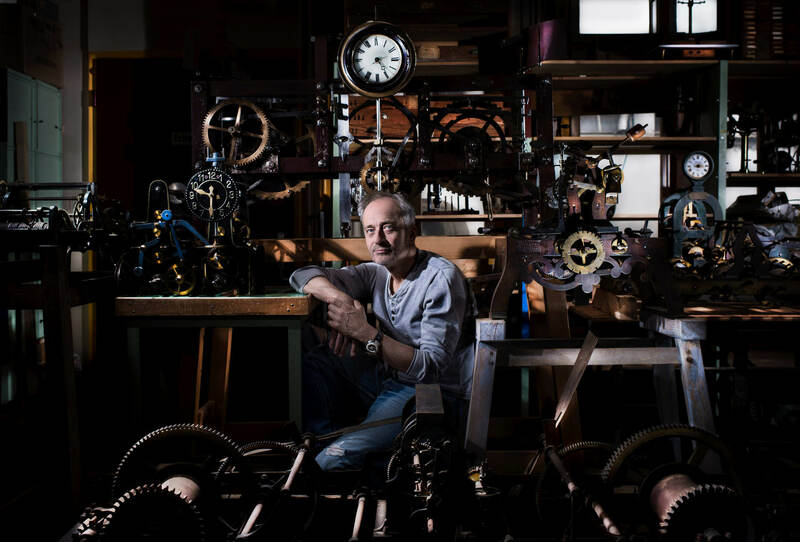 “Italian design codes with Swiss watchmaking skills,” summarises Buonamassa Stigliani, who returns to Rome regularly for inspiration. Presented with an eight-sided case, a round bezel, and an octagonal flange on the dial, the Octo structure is far more complex than it first appears. The case is sculpted with an incredible 110 facets, polished and satin-finished to the most stunning effect. Smoother than it sounds, the Octo is classic and easy-to-wear. 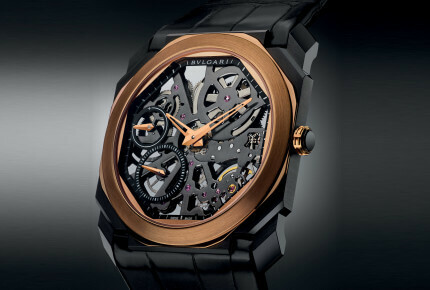 In a 41.5 x 10.55 mm pink gold or steel case with a rich black lacquer dial and a black alligator strap, the Octo was launched to become a pillar for the Bulgari men’s collection. Adding to the unique design appeal of the timepiece is the in-house movement: the self-winding Bulgari Calibre BVL 193 with classic three-hands and date functions, and a power reserve of 50 hours with two barrels. 2014 was a landmark year for Bulgari and the Octo. 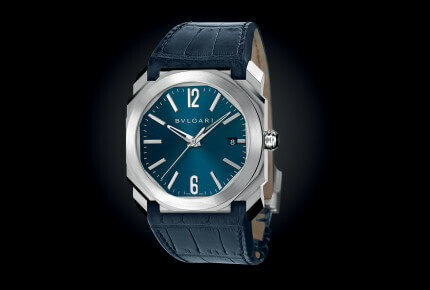 Just two years after having introduced and positioned the watch, Bulgari took everyone by surprise with the introduction of the extra-thin Octo Finissimo. A result of the vertical integration of the brand, the manual-winding Finissimo was also developed and manufactured entirely in-house. 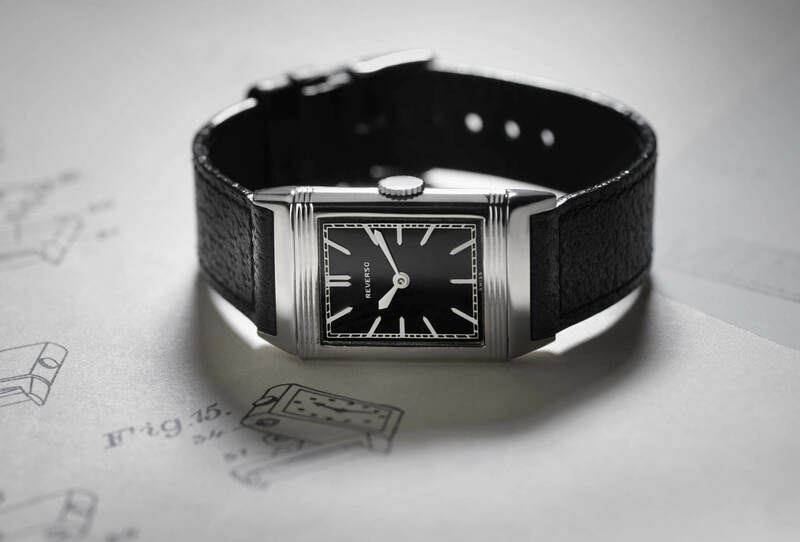 It shows an hour and minute display, with a small seconds hand at 7:30 on the dial and the power reserve – an impressive 65 hours – indicated on the back. All this for a calibre that is only 2.23 mm thick! 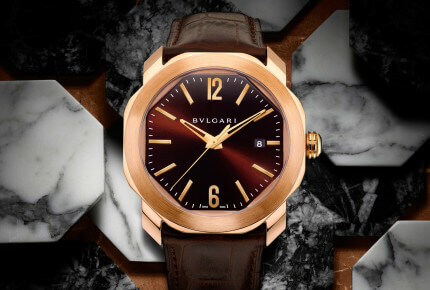 Bulgari was intent on “going where others don’t go”. In an even more astounding move, that same year it set a world record for the thinnest tourbillon movement ever made, just 1.95 mm thick. Record assoluto! The entire Octo Finissimo Tourbillon watch measures 40.5 mm in diameter and an amazing 5 mm thick. 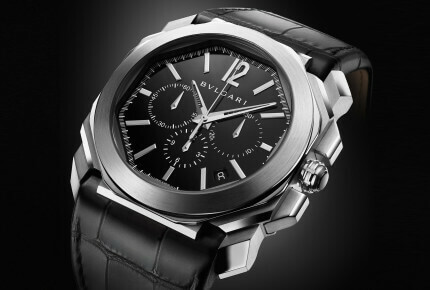 In this landmark year, Bulgari also introduced its in-house chronograph movement, the Velocissimo Calibre BVL 328 (based on the El Primero from Zenith). 2016 saw the introduction of the Ultranero line, including a Finissimo Skeleton version presented with a 40 mm “very black” steel case with D.L.C. (Diamond Like Carbon) coating that contrasts with a pink gold bezel and dial elements for a gorgeous result. 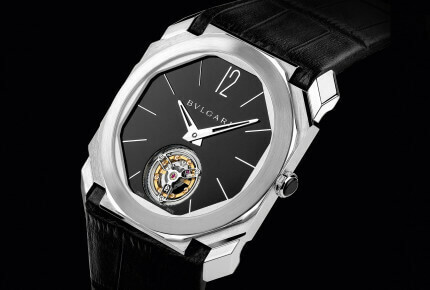 Also in 2016, Bulgari set a second world record with the highly complicated Octo Finissimo Minute Repeater and its movement, just 3.12 mm thick. 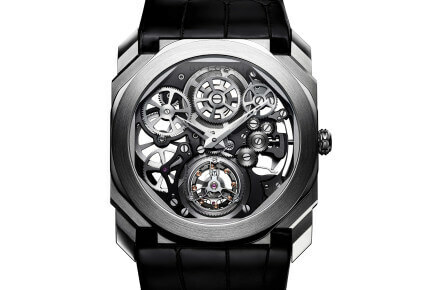 With a total case thickness of 6.85 mm, it is (still) the thinnest minute repeater in the world. It took five years to develop, and required a special titanium case and dial to optimise sound volume. 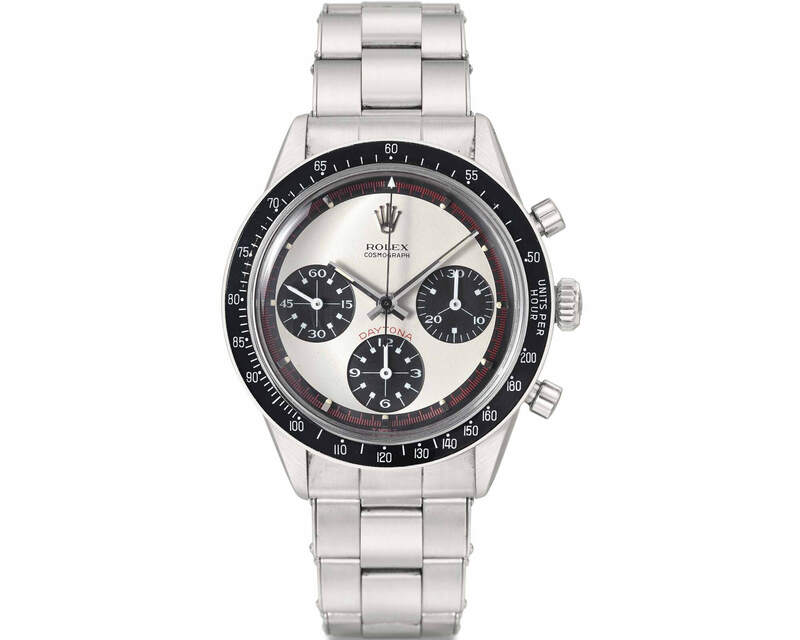 Octo prices start at €5,800, with minute repeaters priced at €160,000. The Design Director knows that price is an important factor for the market today. Octo is the best-seller for men (ladies too appreciate the extra-thin models), with a wide range of products and prices. “We need to have iconic pieces to tell the story of the brand, with a very unique Italian design and Swiss manufacturing, and which at the same time make sense with the needs of the client and the market. Octo prices start at €5,800, with minute repeaters priced at €160,000; that’s between €40,000 and €50,000 less than our competitors.” Marketers say that iconic products are built with instantly recognisable designs, an interesting story, excellent quality, and the ability to personally relate to a customer. 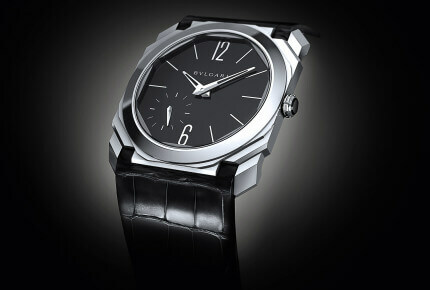 With these requirements, it would seem that the Bulgari Octo is well on its way to reaching icon status.